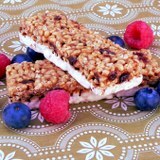 Try our fruity Double Berry bar for a delightful berry taste. It is both crispy and chewy with a sweet coating which is sure to satisfy your sweet tooth! See ingredients and nutritional information. Products with the Limited Symbol are considered Limited Products. Dieters on the ITG Weight Loss Plan are allowed (1) Limited product per day. Products with the Specialty Symbol are considered Speciality Products. Dieters on the ITG Weight Loss Plan are allowed (2) Specialty products per week. Products with Soy Free Symbol are Soy Free, however they may have been manufactured on equipment that may have processed milk, wheat (gluten) soy, egg, peanuts and tree nuts. Products with the Kosher Symbol have been Kosher Certified.